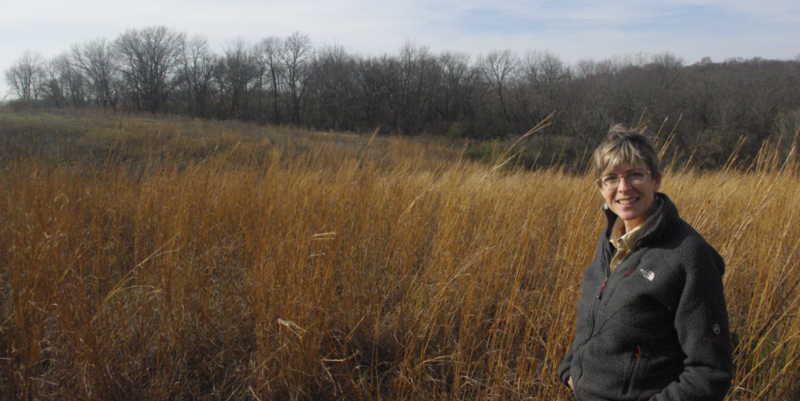 Sue Peterson is transforming her grasslands into high quality, native prairie and managing her woodland for biodiverse wildlife habitat and timber value. 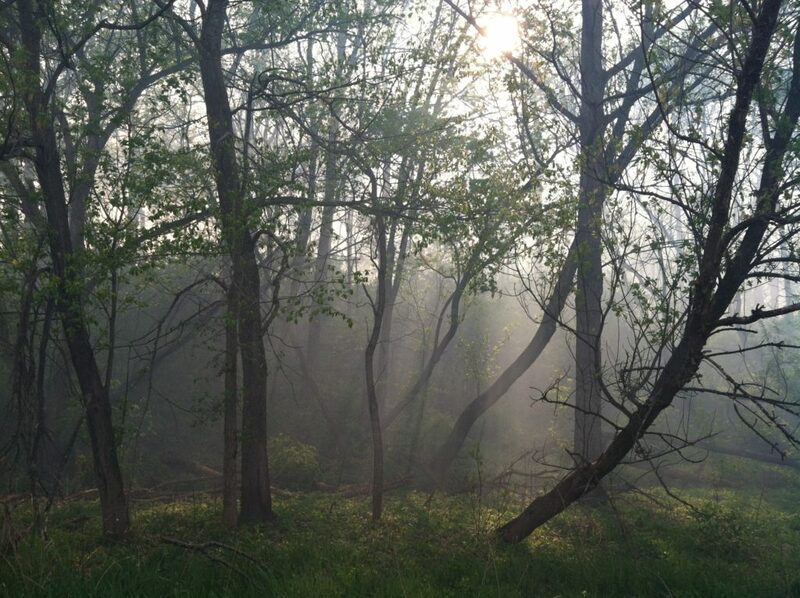 When Sue Peterson and her late husband, Bob Black, purchased 94 acres in the ‘Bohemian Alps’ of northeast Johnson County, they were thrilled to see nature reclaim it. It was the early 1990s and much of the degraded landscape of eroded crop fields had been enrolled in the Conservation Reserve Program (CRP). “We saw it as a unique opportunity not only to live in the country, but to also have enough acres to be surrounded by wildlife,” Sue explained. She and Bob were able to seed half with diverse prairie and the other half with smooth brome grass, planning to convert it to diverse prairie at a later time. 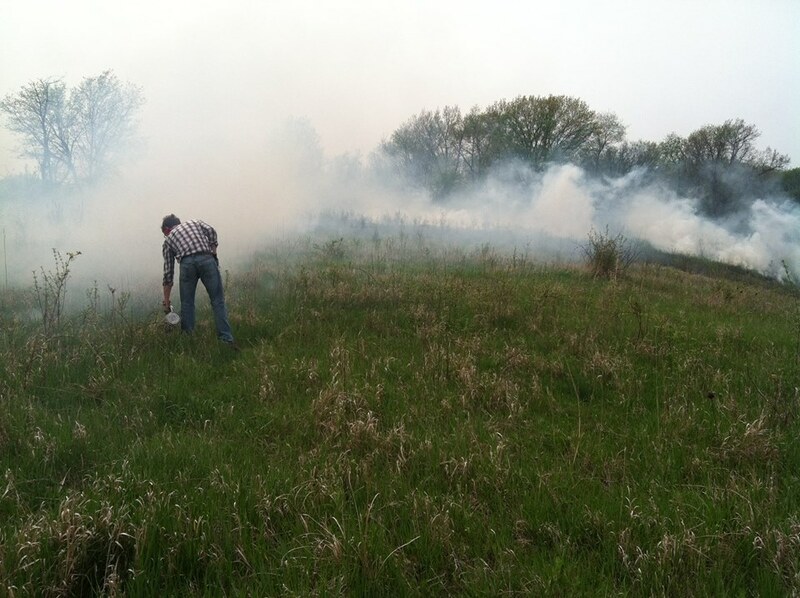 “Burn Bosses” Jared and Andrew conducted a late April prairie burn, enabling Sue Peterson’s land to continue in CRP, and reinvigorating native species. Beyond the reconstructed prairie, forest covered about a third of the land. The diversity of habitats made the farm an ideal field trip destination for Bob’s biology students, who mapped vines and trees in the forest and monitored nesting and feeding behaviors of songbirds. With many of the neighboring fields also converted into CRP and perennial pastures, wildlife had returned to the area in some astonishing ways, including not just birds and other animals lower on the food chain, but higher predators including a den of coyotes, foxes, a bobcat, and once, even a mountain lion passing through. In 2012, mid-contract management was required to re-enroll the prairie in CRP, meaning that Sue needed to conduct a prescribed burn to remain in the program. Unexpectedly, she had a difficult time finding a reliable provider with the skills and availability to burn it and became concerned about losing CRP status. In the spring of 2016, just as the final window for a prairie burn was closing, her daughter Carmen suggested that she call Prudenterra. Luke stopped by to scope it out, and within a couple of weeks, fire had run its mosaic across the land. On the early summer Land Walk (just two months after the prescribed fire), white and cream wild indigo were in full bloom. 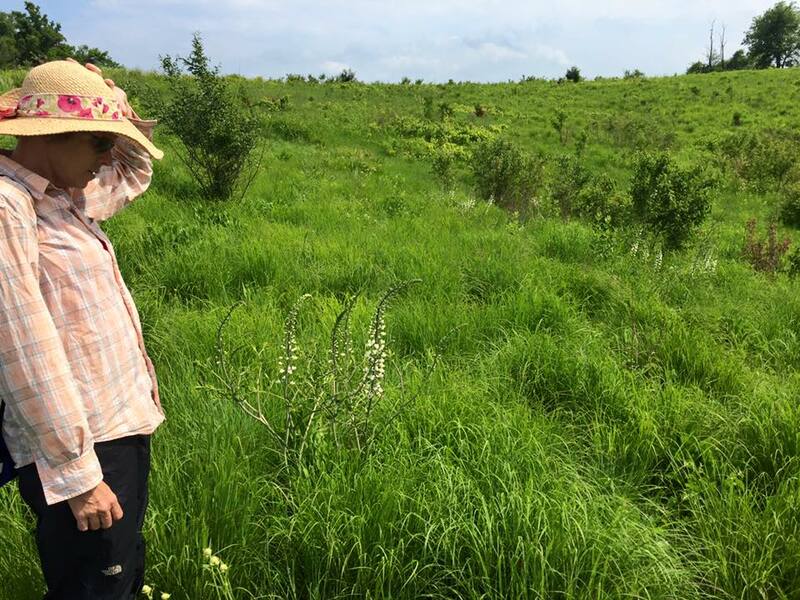 In late June, they started working toward Sue and Bob’s vision by setting out on a Land Walk across the recently burned prairie, which already showed a surge of growth in native grasses such as big bluestem and indiangrass, as well as prairie wildflowers. Sue reflected, “Last spring’s burn confirmed what we thought–that there was a lot of stuff out there that would be more apparent if we could get it burned. White wild indigo was abundant, and I could see gorgeous cream wild indigo from my yard. They must have been out there all along, but not blooming…the fire stimulated them to bloom.” The remarkable impact of the prescribed fire reinforced Sue’s eagerness to convert the remaining brome grasslands to native prairie. The first step in prairie restoration is typically to terminate the brome with a herbicide such as glyphosate (Roundup®), particularly when the ground is covered with aggressive, non-native cool season grasses. However, Sue was concerned about potential long-term impacts of the herbicide and wondered if it would be possible to use a non-chemical approach. The idea of seeding native prairie without a “clean seedbed” was so novel and potentially risky that even the local Farm Service Agency (FSA) and Natural Resources Conservation Service (NRCS) offices had not previously approved it. 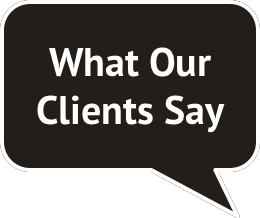 Recalling a conversation with Prairie Moon Nursery in Winona, Minnesota, Sue believed that they had successfully planted a prairie in an old brome field, using burning rather than herbicide to terminate the brome. A quick phone call confirmed that Prairie Moon had successfully achieved prairie reconstruction success by conducting an early May prescribed fire in each of the first five years of establishment. With this evidence, the FSA and NRCS granted special approval. Although conducting five prescribed burns was more costly than a single application of herbicide, it was worth it to Sue. 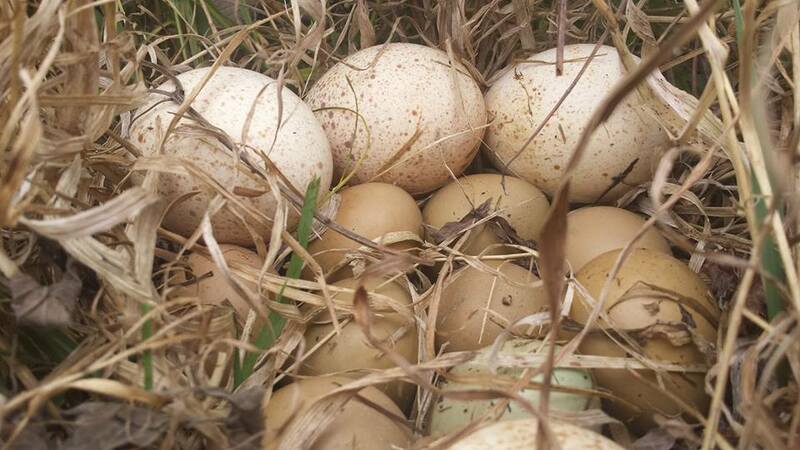 Olive colored pheasant eggs, brown speckled wild turkey eggs, and a green (possibly mallard) egg were in a single nest on a portion of the prairie bottomland that borders the forest. Birds occasionally “dump” some of their eggs in the nests of other species. During the Prudenterra Land Walk, Sue and Luke had discovered some unexpected gems in the woodland. Hidden among the mixed hardwoods was an oak savanna remnant with towering oak and hickory trees. Years ago, Sue had worked on an oak savanna restoration at her college’s arboretum, and she was excited about the opportunity to restore a native ecosystem with such extraordinary wildlife habitat value. This winter, oak savanna restoration will commence on the six acre woodlot with the removal of all trees other than oaks, walnuts and hickories, as well as non-native shrubs. Woodland burns will be conducted in eight out of the next ten years to stimulate the return of the native prairie flowers and grasses on the savanna floor. Sue is thrilled to see how the ecological community and diversity of wildlife will change with restoration. Sue will be managing this portion of the woodland to encourage the growth of valuable timber species, and to benefit wildlife. To double the rate of secondary growth of the walnuts for a future timber sale, Sue decided to invest in Strategic Tree Selection. With this practice, 30-40 trees per acre are selected for high quality form and timber value. Then, lower value trees that compete with their growth are thinned out. In addition to speeding up high value timber production, this practice improves wildlife habitat by providing dead standing trees for cavity nesting birds like great horned owls, woodpeckers, bats, and other mammals. Selecting for walnuts, oaks, and hickories also increases the production of nuts, a rich food source for wildlife. 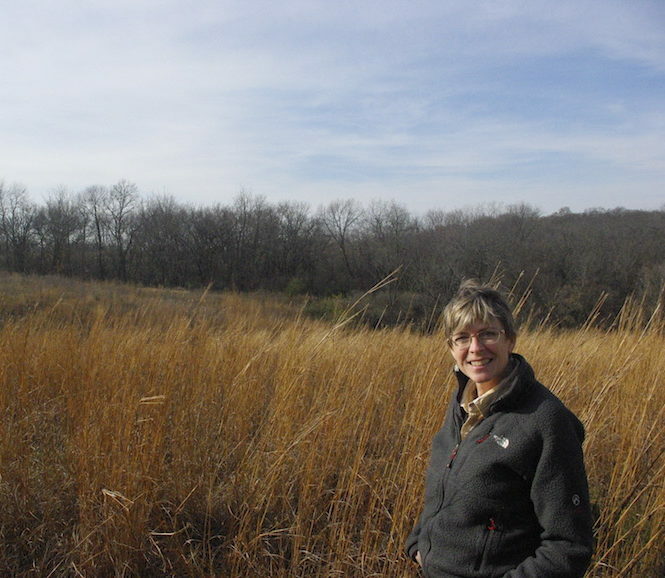 After 25 years of owning land and observing wildlife, Sue Peterson is taking on a more active role as an ecosystem manager by restoring native prairie and an oak-hickory savanna, as well as managing her woodland for high value timber production. Along the way, she has been a trailblazer in finding new methods of restoration that align with her values. Sue hopes that the restoration on her farm will continue to provide valuable wildlife habitat for generations to come.